We get it...you might need some time to finalize your selection. If you're like most of our customers, your doors or gates may need to be measured, spouses may need to be consulted, installers may need to be contacted, Board of Directors may need to approve an expenditure, and so on. And while you are busy lining things up, the sale prices might expire. It can be very frustrating! And if you are not familiar with our keyless locks, it can be a daunting task just to keep track of the items and options! That's why we created Instant Quotes. You can create an Instant Quote on our website for free, pretty much just like you would create an order. Just put the items you want in your Shopping Cart as usual and go to the Checkout page. Once there, instead of selecting and entering your payment information, select the free, no-obligation Instant Quote option. That will store a record of your selections AND lock in your prices for 14-days. 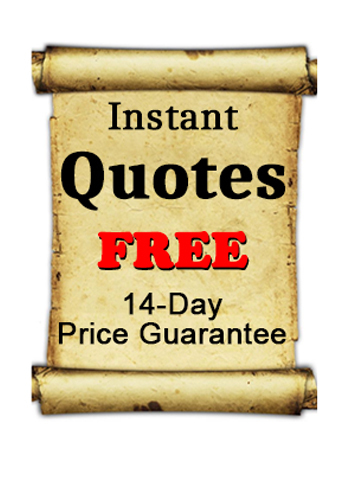 So, if the sale ends before that, you are guaranteed the price on the Instant Quote. When you create an Instant Quote, you will receive an email confirmation that shows each item on your quote, all the options, and the prices. It will also include the shipping costs and any discounts that you qualified for. You can even get an official PDF version you can submit to your Board, your Accounts Payable Department, or your boss. Just keep in mind that the items on your quote won't be shipped until you convert your quote to an order and make a payment. When you are ready to do that, just log in to your account (use the Forgot Password link, if needed), click on My Account in the top right corner of almost every page, click on My Orders to see your past order(s) and quote(s), then click on Convert to Order. That will load up your Shopping Cart with all the items on the quote. You can modify these as needed, and adjust quantities, add more items, even delete items. When everything is just the way you want it and you are ready to place your order, just go through Checkout and make a payment as usual. You will receive an email order confirmation, as usual, and a new order number.